Wednesday's Fed policy announcement may be hard to decipher butwhat's behind the collapse of the potash mining industry is even more mystifying. NEW YORK (TheStreet) -- The Federal Reserve's bond-buying extravaganza will continue until further notice. That's mainly because the U.S. economy is growing only modestly, a downgrade from its June diagnosis. Fed Chairman Ben Bernanke said after the June meeting that the Fed may taper the bond purchase program later in 2013 if the economy and jobs market continued to improve. Yet, thanks to disappointing economic growth numbers in the second quarter of 2013 released earlier, the Fed described at Wednesday's meeting that the economy was expanding at a "modest pace." At its June meeting the Fed described economic growth as "moderate" and forecast that growth could be at least 2.3% for the year. But the third-quarter number showed a dismal 1.7% growth rate. As alarming is the fact that the U.S. economy has grown at below a 2% rate for three straight quarters. Neither the stock market nor the bond market knew what to make of the Fed's Wednesday pronouncement. If a big correction is to ensue like it did after the June Fed announcement it apparently is on hold at least till Thursday. Friday's jobless rate report, which has been stuck at 7.6%, may weigh in heavily. Now let's switch gears. The day before the Fed's statements a cartel that sets the prices for one of the most important agricultural commodities collapsed like an overheated runner in a desert marathon. This international convulsion sent the agricultural fertilizer market into cognitive dissonance and has the potential to cause more of what the Federal Reserve of the U.S. doesn't want -- deflation! It all started in Moscow after the Russian potash producer Uralkali ( URALL lowered the boom and said it was withdrawing from an integral sales partnership with Belarus. This was the straw that broke the back of an international cartel that controls over 66% of the $22 billion market for the fertilizer ingredient potash. URALL hit a 52-week low on Wednesday before recuperating to $22 a share, down more than 8% for the day. North American companies weren't spared from the bloodbath. Shares of the company with the largest producer capacity of potash on planet earth, Potash of Saskatchewan ( POT imploded Wednesday to a 52-week low of $29. This was just one day after POT shares closed 16% lower on the initial news. Including Wednesday's 8.3% rout shares are down almost 25% in 48 hours. This in spite of POT receiving permission Wednesday from the Toronto Stock Exchange to purchase up to 43,345,992 shares at its discretion between Aug. 2, 2013, and Aug. 1, 2014, subject to "a maximum aggregate amount of $2 billion." Potash intends to retire all the shares it buys as part of this big-time repurchase program. The other big-name potash producers are Mosaic Company ( MOS - Get Report), down over 23% in two days and Agrium ( AGU which wasn't hit as hard since it deals with a wide assortment of other agricultural products and services. 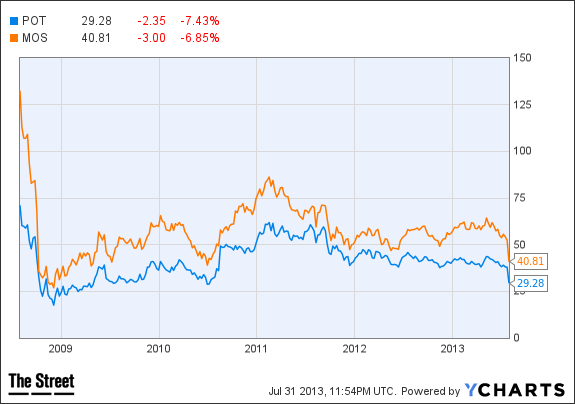 The following five-year price chart compares shares of POT and MOS. It's a sad chart but may also eventually spell opportunity for bargain-hunters and bottom-feeders. Stories and rumors abound concerning possible new potash coalitions forming, including a suggestion that URALL might consider joining with Belarus to form a Swiss-based trading company. Whatever happens, few analysts disagree that new global potash projects are likely to be delayed. Mark Gulley, an analyst at BGC Financial was quoted as holding out some hope about the situation. "If Uralkali and Belaruskali can settle their difference, then much, if not all of the damage from yesterday's Tuesday's breakup could be reversed", he suggested. Hints like that are helpful. Other analysts reminded investors that the two big potash players have broken up before. They noted that URALL's press releases keep hope alive for the Belarusians with text suggesting that URALL won't "exclude the possibility of cooperation on a beneficial basis in the future." One reality appears certain now. Potash producers must prepare for lower prices even though global production projects will be delayed and worldwide demand for potash will be rising in the year ahead. For the time being the cost of producing food in places like China and India will be going down with the price of food. This will likely be felt in disinflationary ways in Western countries as well. All the more reason for the Federal Reserve to keep stoking the flames of quantitative easing and bond buying for many quarters to come. Remember what happened to the stock market in June after the Fed's follow-on rhetoric days after the last policy meeting. As one Canadian bank advised clients who have invested in the fertilizer ingredient companies, "keep calm and carry on." This might be a timely, universal mantra for whatever financial turmoil lies ahead no matter which markets are impacted. Marc Courtenay is the founder and owner of Advanced Investor Technologies, LLC, as well as the publisher and editor of www.ChecktheMarkets.com. Courtenay holds a Master's of Science degree in Psychology from California Polytechnic State University, and is a former senior vice-president of Investments for two major brokerage firms. He's been a fiercely independent investment "investigator" and a consulting contributor to the investment publishing world for over 30 years. In addition to his role as an investment publisher and analyst, he serves as a marketing consultant to the investment media industries. In his role as a financial editor, he specializes in unique investment strategies, overlooked stock investments, energy and resource companies, precious metals, emerging growth companies, the prudent use of option strategies,real estate related opportunities,wealth preservation, money-saving offers, risk management, tax issues, as well as "the psychology of investing". Because of his training and background in Clinical Counseling and Psychology, he enjoys writing about investor behavior, the ¿herd mentality, how to turn investment mistakes into investment breakthroughs and the stock market's behavioral trends and patterns.